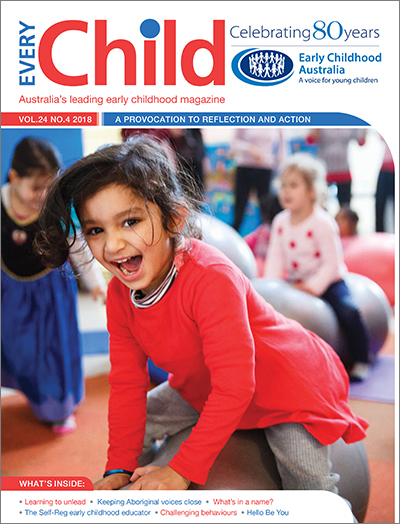 This edition of Every Child magazine shares articles from some of the presenters at the 2018 ECA National Conference. Articles include: The Self-Reg early childhood educator; Keeping Aboriginal voices close: Finding a third space in which to teach; Learning to unlead: The practice of love and hope as a revolutionary approach to leading; Finding your identity as a leader in early childhood and much more. Be the difference for children and families was the inspiring theme for ECA’s 2018 National Conference. This edition of Every Child magazine shares articles from some of the presenters, including an ‘overwhelmingly positive’ wrap-up from ECA’s CEO, Samantha Page, in her guest statement. Dr Stuart Shanker reminds us of the importance of early childhood educators and their understanding of mindful self-regulation; Kerryn Jones, Katrina Tjitayi, Penny Cook and Makinti Minutjukur discuss understanding cultural competence through the lens of co-creating a ‘third space’; Lou Gilfillan, Dr Anne Kennedy and Cat Kimber look at families learning together through the Home Interaction Program for Parents and Youngsters (HIPPY); and Anthony Semann discusses learning to unlead in order to bring back a definition that aligns to more humanistic traits rather than organisational outcomes. In other conference articles, Lisa Thorpe and Angie Zelella present a strengths and rights-based approach to working through trauma with Aboriginal children; Leora Coleman presents an organisation’s approach to developing leadership skills; and Dr Anne Kennedy looks at the importance of reflecting on what language is used to talk about work and professionals in the early childhood sector. Challenging behaviours: Could giftedness be a factor? ECA welcomes a new mental health in education initiative … Hello Be You! THE Pod initiative by Investing In Our Youth.